Nottingham, a city long linked to the folklore of Robin Hood and his band of merry men, is one of the UK’s most underrated locations. It’s a great mix of history and the present day and boasts excellent transport links, has plentiful shops, a number of top sports teams, and a solid music scene. However our visits as a kid were always remembered for the foul smelling mushy pea bar found in the basement of the Victoria Centre. Locals loved ‘The Hot Pea’ man but we dreaded the moment our grandpa would head down for a cup of the local delicacy. Fortunately one of Nottingham’s imported residents has finally put those ghosts to rest with one of the best burgers you’ll find in the whole UK. 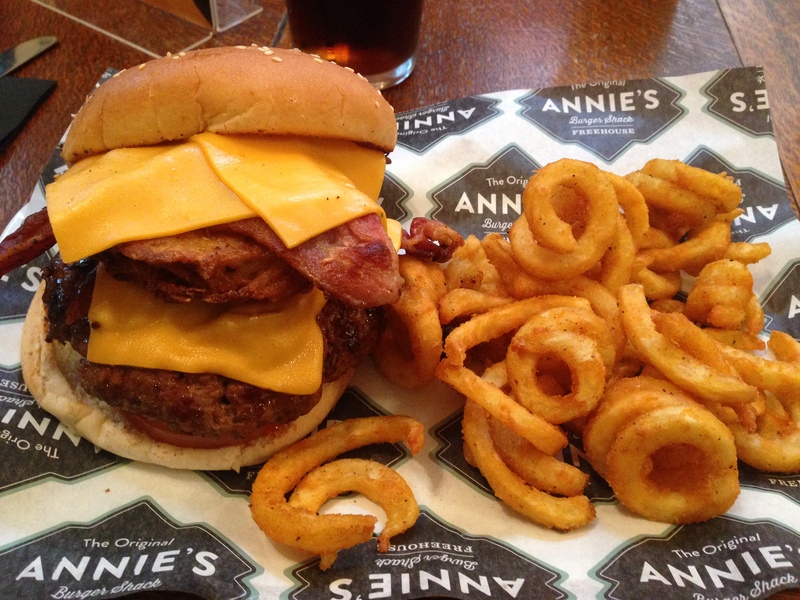 Allow us to introduce you to Annie’s Burger Shack. The Joint: Annie’s Burger Shack, 5 Broadway, Lace Market, Nottingham, NG1 1 PR. You can check out their website here. The Vibe: Annie’s Burger Shack first opened in the city’s lace market area in 2009 and has, thanks to their ambitious menu, steadily grown in popularity. Their take on American fast food is so popular even that we booked weeks in advance to guarantee a bite of the good stuff. Annie herself, hailing from Rhode Island on the US East coast, is visible as we walk through the door today. Her empire is a beautifully presented restaurant divided by a well-stocked real ale led bar. Whilst the casks of ale are a pulling point for some visitors, it’s the burgers that obviously draw us in. We order The Reggie and The Hawaiian both with curly fries and wash them down with a pint of cola (…no drinking and driving for us!). The Reggie burger is a solid beef patty stacked with FOUR slices of crispy bacon, generous slabs of Velveeta cheese, and a crunchy hash brown. It needs a touch of sauce to soften it up but aside from that it is absolutely glorious. The burger itself is full of flavour and complimented well by the sweet bacon and the soft cheese. The Reggie is hands down one of the most enjoyable burgers we’ve eaten on OutForLunch. You then have the Hawaiian burger complete with slices of gammon, melted swiss cheese, and a juicy pineapple ring. We’re not normally ones for mixing fruit with our mains (a pineapple does not belong on a pizza) but the sharp juice works well with the burger here. The curly fries are a nice touch too, especially with them included in the price and not ordered as a side like many of London’s burger bars. With kick off time at the football fast approaching we leave Annie’s absolutely stuffed. The burgers here are delightful and, with a huge menu featuring some mouth-watering options, we hope this isn’t our only visit. The Price: Between £9 and £12 for a burger and side and £2.50 for a pint of soft drink. Annie’s Burger Shack was visited by Tom in April 2015. 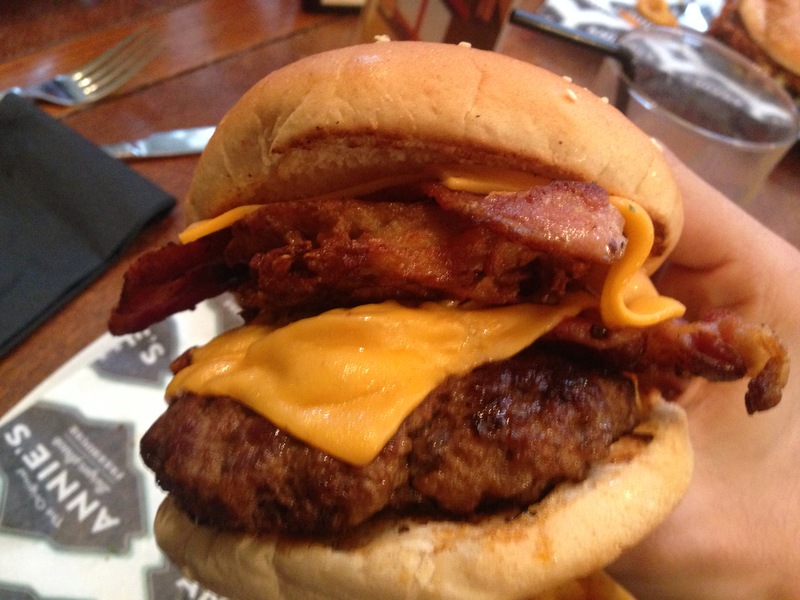 Posted in NottinghamTagged annies burger shack, bacon, beef, Burgers, Food, gammon, hash brown, lace market, lunch, nottingham, Nottinghamshire, Pineapple, real ale, reggie burger, Rhode Island, velveeta cheeseBookmark the permalink.